A group of friends and supporters of BWI were honored to be able to receive Ven. Yonge Mingyur Dorje Rinpoche and Ven. Khenpo Karthar Rinpoche on Monday, May 14, 2007. If you don't already know of him, Ven. Khenpo Rinpoche is an iconic figure, an elder sage of the Karma Kagyu lineage in America, having dedicated the last 30 years to the growth and activities of His Holiness Karmapa's seat, Karma Triyana Dharmachakra, and its related centers and study groups across the country. I remember visiting Khenpo Rinpoche and the newly-constructed temple of KTD in early 1990, the day after a group of us completed the Drup Dra, or 40-month retreat training at Kagyu Thubten Choling across the Hudson River. Later that year I had the honor to translate for Rinpoche when he offered a seminar on the three vehicles of Buddhadharma, and I discovered the rich humor that plays just beneath his rather formal profile. 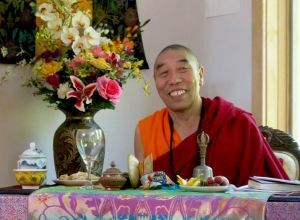 Mingyur Rinpoche, of course, is a shining star in the contemporary firmament of Buddhist teachers, as he genuinely embodies the legacy of his father, the late Lord of Refuge Tulku Urgyen Rinpoche, and works and travels tirelessly to propagate the true dharma of the Kagyu lineage. Lama Sherab asked Rinpoche to comment, based on his training and experience both in the Mahamudra tradition and in western cognitive science, on the various references in the Mahamudra Prayer to things (chos), objects (yul), perceptions and appearances (nang wa) all being "mind." These are Mingyur Rinpoche's remarks, lightly edited. Any error is therefore our own. The essence of mind is connate dharmakaya. Connate appearances are the light of dharmakaya. Connate thoughts are the flow of dharmakaya. "Modern science says mind is not a thing, but a series of events, neurons and chemicals in the brain working together. Until 10 years ago, scientists believed a special area of the brain was the controller of the others. They no longer believe that the functioning of neurons and cells has such a conductor. There is none to be found. I had some discussion with cognitive scientists, and the first issue we discussed was mind. They don't understand it, because no area of the brain is mind. I call this in my book the 'missing conductor.' We cannot see mind, so that is the same as the view of mind in mahamudra, where it is taught that mind has no real location, cannot be seen. Another issue was that some scientists say if mind has no location, then how can you think? There is this persistent experience of me, a continual focus on me, that seemingly holds our experience together. If they take the view that this self is just made up, well then, who made it up? You end up with an endless regression, as one knower has to be made up by another knower, and so forth. This doesn't work. In Buddhism, mind made it up. The conductor is mind. But mind is not something tangible to the five senses, not seen or heard, and so on. There are two minds, the monkey mind and the nature of mind, Buddha nature. The latter is not impermanent, doesn't depend on the brain, but monkey mind does, like a support and supporter, pilot and airplane; the physical body is like the airplane, the engine is the heart, wires are the channels, nerves. You need a pilot to make it function. But what is the pilot? The monkey mind is important according to science and Buddhism. Monkey mind is like a movie projector, perceptions are like its projections. What you see, hear, you produce. If you have no concept of a certain object, for example, you can't see the object very well, like those tests where some people see a drawing as two vases, and others see a face. You cannot see both at the same time. So at this level appearances or perceptions are mind. There is still something out there in neuroscience, atoms are really out there. But according to physics, quantum mechanics, atoms in the end become fuzzy, uncertain, unclear, indeterminate. An atom is not really solid, it is like light, or energy. Energy, space and time all mix together, in quantum gravity these terms lose meaning and collapse. Scientists collapse. (pause). I said scientists collapse! They cannot apply mathematics, nothing is there to measure, but scientists don't like this, it feels nihilistic. In Buddhism this is unlimited potential, real openness or freedom; not truly existing, anything appears. Even atoms are not out there, so they can come from mind, but not like a mother produces a baby. Otherwise we could argue, "you come from my mind," and "no, you come from mine!" If we go beyond the fuzzy, beyond the table, we have a table again. This is the table beyond the table. Table is fuzzy, no real table, beyond fuzzy is a dream table. It appears perfectly as a table, but it is not a real table. Appearing and not really existing become one, which is the table. Take the example of Milarepa and the horn. Milarepa crawled inside the yak horn, even though the horn didn't get bigger and he didn't get smaller. That is beyond fuzzy. Scientists now say a whole universe can fit in a tiny space, nothing gets bigger or smaller. Scientists said three years ago in the U.K., talking about the big bang theory not working, that they could create a universe in the lab, and it would not take up any space within our universe, but we could detect it by its effects. Two waves of energy crashing together create a universe. So a whole universe can fit inside a horn!